← Leroy turns five today! Oh dear … this is SO familiar !!! lol!! Last year we never put our tree up – because Saffy was a baby and it would have been ripped limb, from limb and all the ancient decorations smashed! 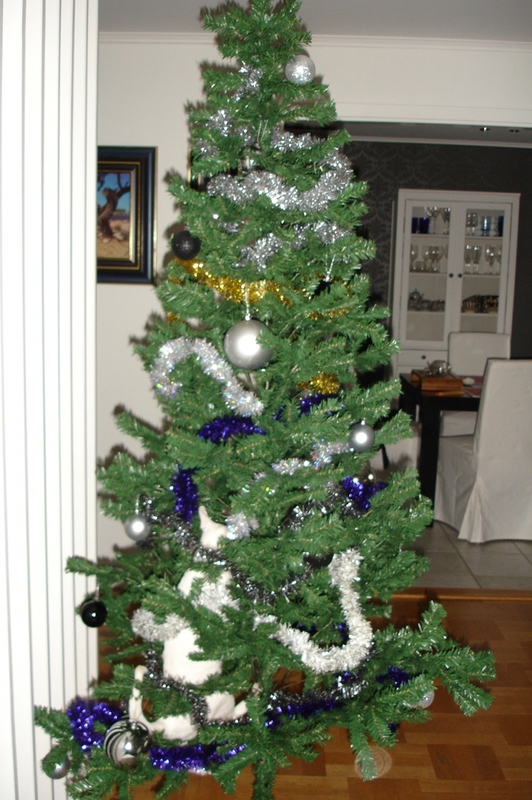 We thought we were safe this year – and put our tree up yesterday ! …. Somehow we forgot the noseyness of the Siamese and have had to chase her a dozen times !!!!! lol!!! I know! We also thought it would be so much easier this year, since Albert is not a kitten anymore… Yeah, right! He is even worse! All of our precious glass decorations are carefully packed in the cellar; I am using the plastic ones we bought last year. He is also chewing on plastic and glitter, so I sprayed the whole tree with Get Off spray (that I never used, the cats are so nice otherwise!). Now our house smells so citrusy. Not a traditional scent of Christmas, not really. Albert stopped chewing on the tree after Get Off (or, he chews a bit, stops, totally disgusted and then looks at me and whines like a little goat “Meeeeeow, what did you put here! ?”, I think he is saying), so it helped. But he is still climbing on the tree! *sigh* … does this sound / look familiar ?? Today … we came into our lounge to discover an extra ‘decoration’! Saffy had climbed up the inside of the tree and was happily chewing this and pawing the balls etc !!!!!! https://www.facebook.com/media/set/?set=a.10150411588951046.349364.649206045&type=1&l=251c8dbd2c PHOTOS of Saffy …. I have some of that type of spray you are using too – and she seems impervious to it but I will keep trying !!! lol!! Yes, Albert sits exactly like that!!! Shaking and swaying the tree and boxing the shiny balls and chewing on the soft decorations. So much fun! What worries me .. is if she starts chewing on the light cables again !!! Why don’t they make trees that have ‘cat repellent’ in them? Sounds a good idea to me !!! lol!! I added decorations in several steps, to see how the White Squirrel will react on them. After the picture of Albert above was taken, I added the electric lights and more ornaments and I have the lights plugged in only when we are at home. I don’t now what can repell Albert. There is nothing he does not like about the tree!